Entering his final year of competing in MMT, Ryan hopes to conclude his career by being a part of the team that wins Miami's second national championship. When not mocking or studying, Ryan serves as an advocate in Miami's Office of Institutional Relations as well as the assistant to Dean Jerome Conley. 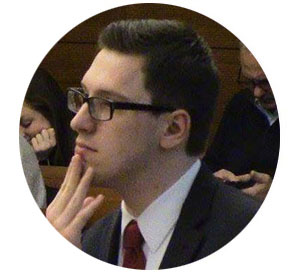 After he graduates, Ryan looks forward to pursuing a career in law, which will enable him to relentlessly read through the rules of evidence and master case law well into the future.